← Cool new gear: Ampeg GVT series all tube guitar amplifiers. The Source Audio Soundblox Guitar Envelope Filter - rack power in a pedal. A press release for a very cool looking effects pedal had arrived in my inbox the other day. The Source Audio Soundblox® Guitar Envelope Filter looks like an extremely powerful envelope filter packed into a neat stomp box format. The Soundblox Guitar Envelope Filter has been built in a similar manner to the Source Audio’s popular Bass Envelope Filter pedal, and offers a lot of the same power as it’s predecessor. Woburn, MA—Source Audio, innovators of the award winning Hot Hand® Motion Controlled Effects and the Soundblox Bass Envelope Filter, are introducing the Soundblox Guitar Envelope Filter. The pedal packs the power and flexibility of a rack-mounted unit into a user-friendly stompbox, staying true to Source Audio’s signature approach of offering maximum tone diversity with extraordinarily easy-to-use and intuitive interface. Source Audio will show the GEF at Summer NAMM 2011 in Nashville, July 21–23. 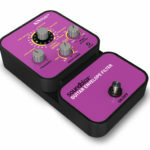 The Soundblox Guitar Envelope Filter was designed in the mold of the very popular Soundblox Bass Envelope Filter. Immediately upon release, the BEF was incorporated into the touring rigs of bass notables, Mike Gordon of Phish, Kevin Walker of the Justin Timberlake and Prince bands, and Jai Dillon of the Jason Mraz band. Source Audio expects to see similar enthusiasm for the GEF. The pedal was already shown at the 2011 Winter NAMM Convention in Anaheim, CA and received a tremendously positive response. Both Premier Guitar and Guitar Player Magazines included the Soundblox GEF as one of the most notable products on the floor in their NAMM recap issues. The GEF offers an extensive set of 21 individual envelope filter effects, from traditional auto wah sweeps to more dramatic vocal simulations. Filter categories include 2 and 4 Pole Low Pass, Single Peak, Triple Peak, Peak & Notch, and Phaser. Due to the finely tuned nature of the pedal, even the slightest gap in the incoming signal will reset the filter position, providing a full sweep range for every note. The control panel is simple, but allows users to dial in a broad range of tones. Minor adjustments, such as a change in the direction of the filter sweep, can produce significantly different sounds within a single filter type. The three-knob control panel provides adjustability to the center point of the frequency sweep, the depth and direction of the moving filter, as well as the attack and decay times. On its own, the GEF can be modulated in the fashion of a standard auto wah, but is also controllable via Source Audio’s patented Hot Hand Motion Controller Ring for a remarkably expressive and unique approach to filter modulation. The unit also features proprietary state-of-the-art 56-bit Digital Signal Processing (DSP) with 24-bit converters for crystal clear output. 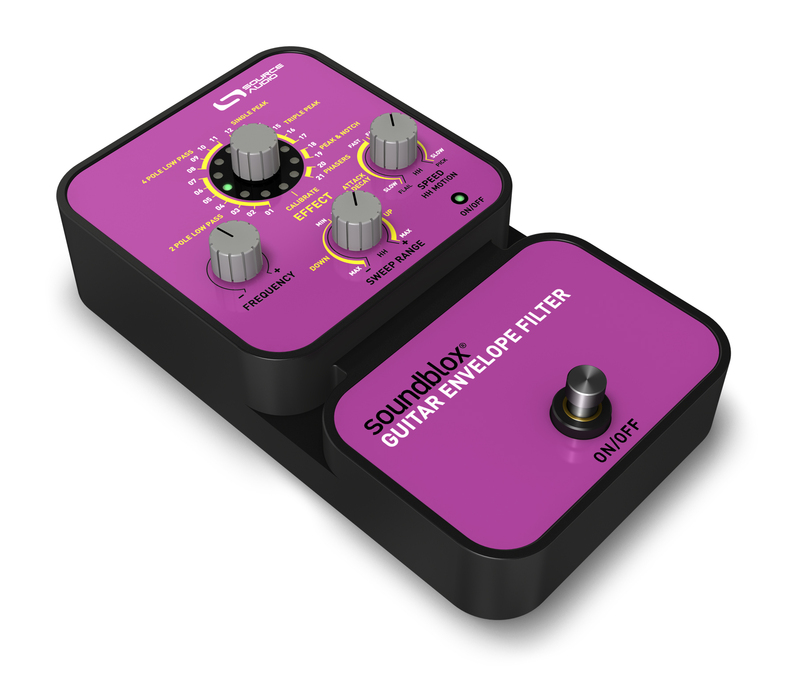 MSRP for the Soundblox Guitar Envelope Filter is $169 (street: $119). It is available now. For more info and a list of authorized dealers, visit www.sourceaudio.net or call Source Audio directly at 781.932.8080. This pedal looks like a lot of fun, and I hope to have a play with it very soon. Update: Here is a video demo from Source Audio, what a killer pedal!